With the weather changing every day, our gardens don't know what to do... The Zenias didn't do well at all. They lost their colour within a month and are now unfortunately due to be removed when I get a free weekend. The Alyssum however seems to love the colder weather. Even those in pots have filled up and are beautifully overflowing. I'm still and will always be addicted to their wonderful scent. 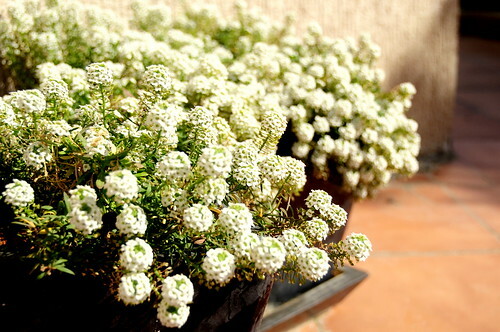 That's it... Next November/December in shaa Allah, I will fill - FILL - the front beds with alyssum. Nothing else.